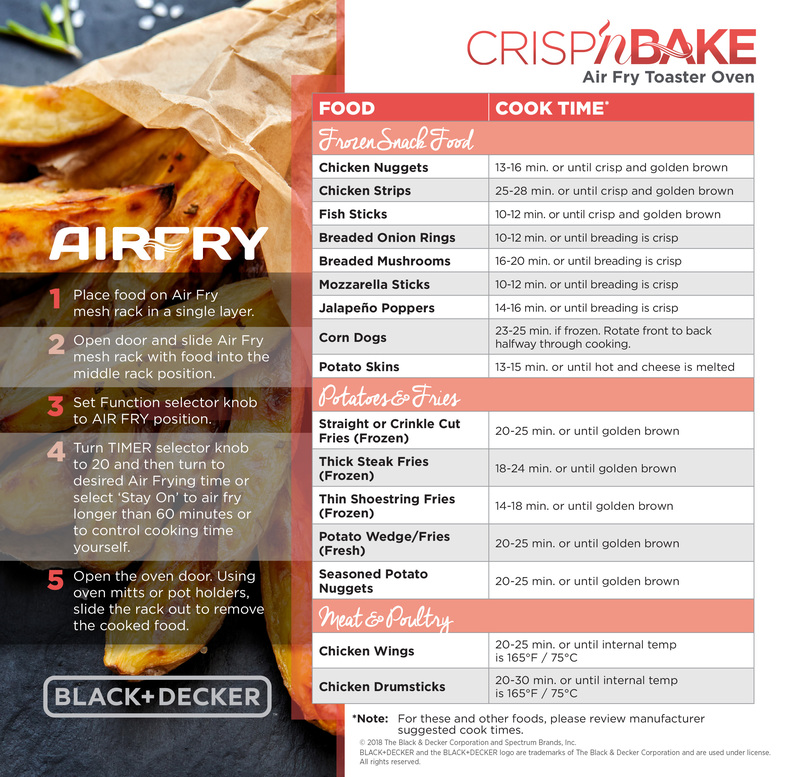 Introducing Air Fry Technology, new in the BLACK+DECKER Crisp 'N Bake Air Fry Toaster Oven. This is deep fried taste without the fat! Air Fry Technology uses high intensity hot air to bake, brown, and crisp your favorite fried foods with little to no oil. Try French fries, veggie chips, breaded fish fillets, frozen snacks, and a lot more! There's space for up to six slices of bread or a 12" pizza. 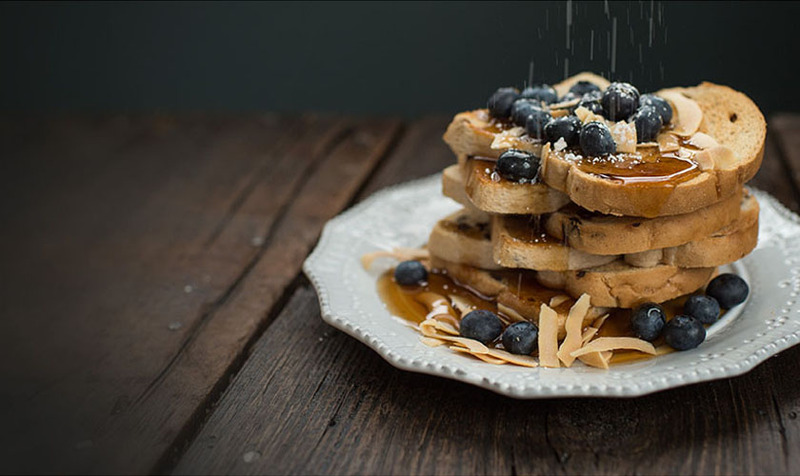 Three control knobs make it easy to set the toast timer and 60-minute timer, and choose from five cooking functions: bake, broil, toast, keep warm, and air fry. Convection technology circulates air within the oven for fast and even results when air frying. Plus, this toaster oven includes an air fry basket, bake/broil pan and rack, and an external crumb tray that slides in and out to make cleanup a breeze. Air Fry Technology – Deep fried taste without the fat! Countertop Baking – Bake and reheat without a big oven! Crisp 'N Bake Air Fry Toaster Oven is rated 3.2 out of 5 by 185. Rated 1 out of 5 by Samsmom from WAS SO EXCITED TO USE IT THEN..... It burned the very first item I put in there! I even had it set lower than the instructions specified so it would cook slower/longer while I finished making the rest of dinner. So I threw the garlic bread away & tried it again. Set temperature 25 degrees less than the first time (by this time it’s set 75 degrees less than the recommended baking temperature for the garlic bread). Timer set as before and......BURNED AGAIN! I was right there in the kitchen with the oven but wanted to see if it would work without my intervention & I was let down yet again. The oven will be going back. I’m just glad I didn’t throw my old toaster oven away before I used the new one. Too afraid to try any other features this oven offered in fear I’d be throwing more food in the trash, I’m only commenting on the baking feature. I typically do not write reviews but I was so disappointed in this product that I felt it deserved a review. With a trusted name like Black & Decker I thought I was buying a superior product but unfortunately I was wrong. Rated 2 out of 5 by Nikki1993 from Temperature I bought this a few months ago and have used it a few times. The other day I baked a whole chicken in the oven and after 3 hours at 350-400 degrees it still was not done. I bought a thermometer to check and see what it was really cooking at. At 450 it is showing its only getting up to 350. Rated 2 out of 5 by lovestoeat from Need More Instructions for Use We got this for Christmas and have used it a few times. It has done well with some foods but not as great with others. The minimal instructions included are not very helpful. Most appliances will give more info - like when it says you can use oil, do you put it on the food or is there a place in the oven to put it. Maybe if there were better instructions we could learn to use this to it's full potential. Help - is there any additional information about this product out there somewhere? Rated 1 out of 5 by Frustrated Val from Where are the instructions?. I just purchased this and was excited to get it home to try it. I opened it, took out everything and there are no instructions! No cooking guide, no use and care, no owners manual, absolutely nothing to tell me how to use it. It’s supposed to have multiple cooking options but there is nothing to tell how to use them. This website only offers a two page document that is mostly what I shouldn’t do and the rest just points to the what it looks like. Rated 1 out of 5 by Manda86 from RUSTS I got this for Christmas, super excited about it, works pretty good but big problem is RUST, I cleaned it as instructed and the tray and inside the oven is rusting, it looks like I've had it for years and not just a few months! It's awful, I have to foil line everything now to use it, very disappointed. Rated 5 out of 5 by Jmanka from Love it Bought a week ago after looking into several. Just tried tonight, mini tater tots on airfry. They came out great! Looking forward to trying other features. Just really wish it had a cooking guide. I've only found a small one online, and it didn't explain when if other rack or pan needed to be removed when air frying, or I could foil the crumb tray. Rated 3 out of 5 by PROSPECT from NEED INSTRUCTIONS JUST BOUGHT IT AND I DON'T KNOW HOW TO USE IT. NEED INSTRUCTIONS. AND WANTED TO KNOW IT THE TOP BURNER TURNS ON TOO. Rated 2 out of 5 by recoop from Good product but needs better manual Just bought this, like it but it really needs a manual with recipes/cooking times. I saw other reviews stating this, maybe if enough people complain there will be one available soon. Would have given better star value and recommendation. Rated 4 out of 5 by Tom1016 from Air fry temperature Just bought and so far no issues, but have one question if someone could answer. When you set it on airfry what is the temperature it is cooking at???? Rated 5 out of 5 by Bob19810 from A great product despite B&D's BIG consumer blunder B&D REALLY messed up by not providing a "traditional" Owners Manual! However, if you really look at the "folder" that comes with the product AND follow the simple instructions, you will be able to use it AND love it! We've used the Air Fryer feature several times, usually for french fries and potato "chunks" and have been very pleased! Just use common sense and follow the instructions! It's really a GREAT product! Rated 3 out of 5 by MR1234 from air fryer feature - no instructions. I love the conventional oven feature, and I have used it extensively, but I have no idea how to use the air fryer feature and keep coming up with uncooked food. I don't understand how they ca sell a complex product with no guidance. Rated 3 out of 5 by mintlabs from 3 in 1- but yet to shine Inspite of all the reviews, I got it as I thought It would be easy enough to find recipes and figure it out.The first try at sweet potato curly fries failed miserably with half burnt and black and the other half still uncooked! !It would really help user adoption if you had a recipe booklet that came with it. Rated 5 out of 5 by LadySegaw from Super Easy to Use! I bought this on Black Friday and I absolutely LOVE it! The air fryer is my favorite part of the entire oven as it has a nice size tray and cooks evenly. It fits nicely on my counter top and is pretty dashing, too. I have not had a problem with anything that I've cooked in it yet. Rated 1 out of 5 by Ideal from NEED A MANUEL I JUST BOUGHT THIS NOT EVEN A MONTH FOR THE OFFICE AND DISAPPOINTED THAT IT DOES NOT HAVE A USER MANUEL. MY GUYS IN THE SHOP NEEDS TO KNOW HOW TO WORK THIS WHEN I AM NOT AROUND HENCE THE 1 STAR. Rated 1 out of 5 by Nancy55 from Not sure how to rate this I bought this item just 2 days ago. I am not sure what to do with it since there are no directions, recipes, etc.. I never had an air fryer before and was excited to use it, but I am not sure how. Rated 5 out of 5 by Kristen85 from I would recommend The first thing I noticed was how light it actually was. I pulled it out of the box and immediately tested it the best way I know how. Air Fry wings baby! It worked great! There was no weird smell like some products have on the first few runs.After a few test runs with about 5 wings I upped the amount. I'm not sure how many, but there was no room left. It cooked perfect and in the same amount of time. Just make sure you leave plenty of room in the back (away from a wall), it does get hot. Lowering the settings its just like any other toaster oven.I tried a prepackaged lasagna, but the plastic on top started to burn...so don't do that. It works great for anything else.I received this product free for my unbiased opinion. Rated 3 out of 5 by Matt4220 from Doesn’t work! I bought this on 10/12 and at first thought it was perfect! Air fryer does not work like it should. Had fried chicken in for 2 hours and still wasn’t done. Made tater tots the other day and had the temp set to 450 degrees and after 20 minutes they were supposed to be done and the were still cold. The outside was hot to touch but I could put my hand inside and hold it there no problem. The elements light up like its on but nothing cooks right. I have also sent an email twice to black and decker to try and resolve this problem and have yet to get a reply. Rated 3 out of 5 by Okie from I love the air fryer feature but..... Mine came without a regular slide-out rack. It was a gift and it is to late to return it. Rated 3 out of 5 by Karenmr123 from Looks good I was so excited to receive this But with no directions I haven’t used it. How do I know how to cook in this. I’m so very upset!!! Rated 3 out of 5 by Giorge from It works I got this for Christmas it works good but they manual that comes with it is a total joke, it doesn't give you any cooking times for the air fryer option. I have an smaller Black & Decker air fryer that cooks faster and better. I am not that impressed with it. Rated 2 out of 5 by Pjbishop from Drip tray Not happy with the lack of manual and recipes for air fryer would have been nice. Baking in this toaster oven seems to burn the top of everything I've tried to bake. I have been using the air fryer so its not a total waste of money, but would like another drip tray. Can you purchase additional drip trays? Have never had issues with Black & Decker products before, but not very satisfied with this one. Rated 4 out of 5 by GDD02 from Nice oven, good price Bought this a few months ago and have used it many times for toasting, air frying andgeneral purpose oven use. So far I am very pleased. I saw allot of low star reviews andthat had me a bit concerned but after my experience I feel those reviews were a bit petty. Yes,the owners manual is extremely vague but it is very common sense product. Drip tray is small but seems to catch the grease when air frying. I have done wings many times, they turn out great and the grease goes into the pan. Yes, there is splatter but very easy to clean.My only real issue is on the hinged door. The glass on the bottom holds allot of crumbs, grease, etc and is about impossible to clean 100%. Rated 1 out of 5 by Dcablemon from No instructions Bought this as a replacement toaster oven excited about the air fryer option. There are no cooking/timer instructions at all. Worthless without them! Rated 2 out of 5 by AmyMI from Not happy with it! Received it for Christmas and was so excited but it has cooked everything way too fast and burns it quickly! You have to watch it constantly! No clue how to use the air fryer as it really does not come with clear directions. So far what we have made in it did not turn out. My husband and son are both chefs and haven't figured it out either!! Rated 2 out of 5 by Janice S from ??? Quality I bought this last month & love it except for the bottom tray that is now disgusting & I’m not able to clean it. Even soaked it over nite to no avail!!! Rated 3 out of 5 by This drives me crazy from Drip tray I was wondering if the drip tray can be covered with aluminum foil, I find it VERY difficult to clean. Or can it be substituted with a stainless steel tray. And it needs an instruction booklet. Otherwise, I am enjoying his to use this new appliance. Rated 4 out of 5 by chall6505 from Great appliance, needs more info After using mine for over a month, it is proving to be a "go to" appliance. This is more accurate and easier to clean than my old toaster oven. B&D dropped the ball with providing guidance for using the air fryer. (Some other companies figured this out, do a search for airfryer toaster oven recipes.) From what I read, this airfryer operates at 400°. I don't know why it's not adjustable like others. Hopefully they'll fix that in the next models. Now that I figured out how to work it, I love using it. Is it perfect? No, but for the price range it is a great appliance. Rated 1 out of 5 by Disappointed Senior from Horrible We bought the Black and Decker Toaster Air Fryer Oven at Kohls as our Christmas Present this year. Good price and trusted brand name. We are absolutely sick that we burned the box it came in because now we can’t return it. We haven’t been able to cook anything in this oven that hasn’t burnt. No cooking guide or recipe book came with the oven and there is only one temperature....wide open! We are senior citizens on a limited income and now we are stuck with a product we can’t use. UGH!!! I will do my research before purchasing in the future! Do NOT put the crumb tray inside the oven. Close the door and the tray slides into a slot just below the door, with the curved tab pointing down. It should be in place whenever you use the oven. Can't believe B&amp;D stopped providing User Manuals on its products!!! I bet they will lose a substantial number of customers as word of this fiasco spreads!! Close the door on the unit. The crumb tray slides into the slot right under the door in the front of the unit. The curved tab on the crumb tray should point down when you insert it. I have a quick question. It does say in the booklet that you shouldn't cover entire elements of the oven in foil (such as the drip tray or the sliding rack), but can I use aluminum foil at all in the oven? Such as baking food in a foil pack. I foolishly skipped reading the many warnings and I put foil on the drip tray. The oven worked fine while having the foil in there during 4 uses! No manual. Extremely common complaint if you look at the reviews and questions. is convection on any time oven is in bake? The fan only runs when you're air frying. It's not a convection oven. Is there a cookbook for this oen? They couldn't sell it in the US if it wasn't. I would like to get the full cooking manuel as well. Please email me the information. There isn't one. You will have to scour the internet and find recipes. Find a recipe you want to try, follow the preparation instructions in the recipe, turn the top knob to the 'air fryer' position and the middle knob to the cook time called out in the recipe. Then, since you can't control the temperature on the unit, pull up a chair and monitor till it looks done. Make a note of the time required on your recipe for future reference. Can I get a complete user manual? Hello - is there a guide with recommended times and temperatures for cooking with the air fry feature? The unit came with a minimal product guide and suggested methods and recipes are needed! Thank you! There is no temperature adjustment on the air fryer feature. You will have to find some recipes on google and experiment. There is no temperature control for the air fryer. It's an on or off situation. How do i control the air frying temperature? There is no control for that. It's either on or it isn't. I am a senior citizen and have owned several different brands of toaster ovens. I just purchased one of these and wonder if they forgot to pack the instruction book in my box. Don't have a clue what to do with the air fryer. May send back if can't use. Nope, the lack of an instruction manual is a common complaint on this model. You didn't get one because they didn't write one. The fan only runs when using the air fryer mode. It is not a convection oven. Rotate the top knob to the desired temperature and the middle knob to the desired cook time. How do I get recipe book and or instructions on how to air fry? There is no recipe book. You will have to use the internet and find some. There are no included recipes. You will have to use the google machine and find recipes. Unfortunately, you cannot adjust the temperature on the air fryer function, so it will be trial and error for any recipe that calls out a temperature. Do u use the external crumb tray with the mesh basket for air frying? Does it remain in the oven at all times? It would be most helpful to have a good instruction booklet . The instructions that comes with the oven are useless!!! Ideas for air frying? The crumb tray slides in under the the door. There is a thin slot beneath the door, you may have to turn the unit on it's back to see it! Where is the darn manual?? &nbsp;Not a piece of paper. &nbsp;How does the crumb catcher go in? &nbsp;Takes up the first shelf slot?? i mean downward.. the lip points downward! I am having trouble using air fryer function. I put the food into the basket, move the knob to the appropriate time after the number 20 like the tiny little booklet says and it is still stone cold after at least 30 minutes when it should take 8 -9.
move the top knob to air fryer position - you will hear the fan turn on. Put the middle knob at amount of time you want to cook. Can you give me more specific directions on how to operate the air fryer mode than are in the instruction paper. Ex: How do you do the timing of the food? Just got mine this evening but the first thing I cooked was air fried. Simply set the top dial to 'air fry' and use the timer of the middle dial. That's it. Can someone email me the recipe cookbook so that I can make the most out of the airfry feature? What temperature does the air fryer cook at?? Most air fryer recipes say cook at 360 degrees or 400 degrees...how do you regulate the temperature on this model?? can I purchase extra crisp tray for this oven ? What are the measurements of this oven and how heavy is it? And are you now including a decent manual with them, that is a major complaint I see on the reviews. I cannot lift over a certain weight or size so that information would be most helpful. It is 18 in. wide. How deep is the unit?